What is the best treatment for hypopigmented scars in Singapore? 15 years ago, I had an accident and underwent a brain operation. 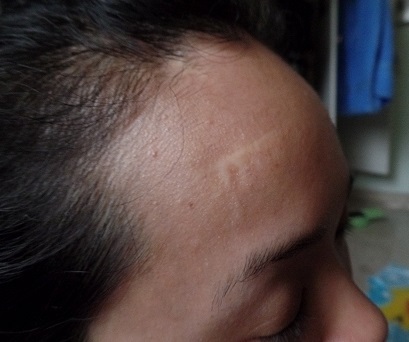 The scar in the attached picture is the result of the operation. I consulted some professionals regarding the scar, but was given different answers from them. I am confused with all the different advice. Sounds like you had a nasty accident and I’m glad that you’ve recovered well from it (apart from the scar). Outcomes are variable and I would not get my hopes up too high. The raised portion is definitely more treatable with injectable steroids, lasers and silicone sheets/gel as you have rightly pointed out. Nonetheless, it would be best to get it examined by a medical professional so that an appropriate treatment plan can be tailored for you. Your scar appears to be hypopigmented – which is why it appears whitish compared to the rest of your skin colour. This type of scars are actually pretty common after any type of surgical procedure – in fact, doctors are trained since medical school to identify these types of scars on the chest and stomach, in order to infer what types of surgery the patient may have gone for. Hypopigmented scars are white because there’s an absence of the melanin pigment producing cells in scar tissue (after your surgery). There are reports that laser treatments can be effective with improving the appearance of these scars – it’s rare to get 100% improvement though. Usually, 30-40% improvement is a pretty good outcome. The Fractionated CO2 Laser (3 – 4 treatments) may improve hypopigmented scars by allowing some migration of pigment producing cells to repopulate the white area. Another alternative is to “camouflage” the white color. The colour of your skin is “matched” to a tattoo pigment. This is tattooed into your white scar tissue to replace the lost color due to the lack of melanin. You will need a specially trained tattoo artist. I agree that hypopigmentation treatment is virtually unpredictable. Light fractional lasers therapy may be of use, but to date there is no sure-way of treating hypopigmentation. Be sure though not to make it worse with strange treatments!